Historian Will Durant is alleged to have said that, among other factors, great cities and civilizations exist “at the pleasure of geology,” and certainly no city bears this out more than San Francisco. With the April 18 centennial of the most devastating earthquake in American history fast approaching, about 30 NCGS members and guests recently had a chance to see a somewhat deeper perspective on that tragedy. 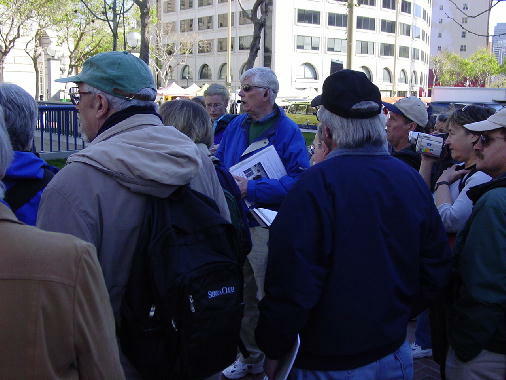 On March 19, Dr. Raymond Sullivan, professor emeritus of San Francisco State University’s Department of Geosciences, led us on a memorable field trip “Retracing the Events of the 1906 Earthquake and Fire along the Old Bay Margins in Downtown San Francisco.” For those like myself, who are not geologists, it was a fascinating and sobering view of the impact of geology in action, especially the consequences of erecting buildings on areas manifestly ill-suited to accommodate them. Professor Sullivan neatly summarized the situation by stating that the first part of the city’s destruction was controlled by geology but, in the second phase, the forces of meteorology predominated: after the earthquake came the fire and the fire destroyed the city. Two other factors became clear in the course of the day. First was the role of structural engineering. Of the 52 steel reinforced buildings in the downtown area, for example, only six were so damaged that they could not be salvaged and rebuilt. The other deciding factor was the human one, where individual actions—or lack of them—made all the difference. 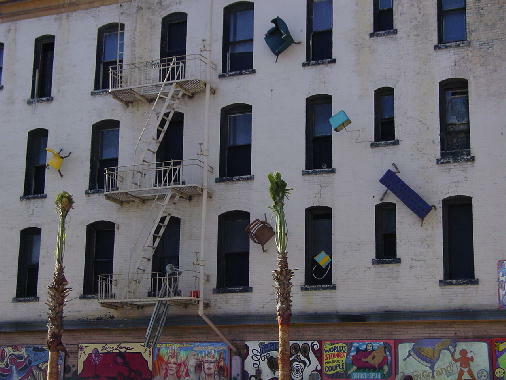 As will be seen, one incident of carelessness resulted in wildly exacerbating the fire in its early stages and the death of San Francisco’s fire chief resulted in serious and irreversible mistakes in handling the fire. 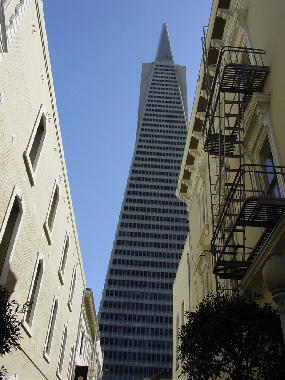 The field trip consisted of three short walks through downtown San Francisco. 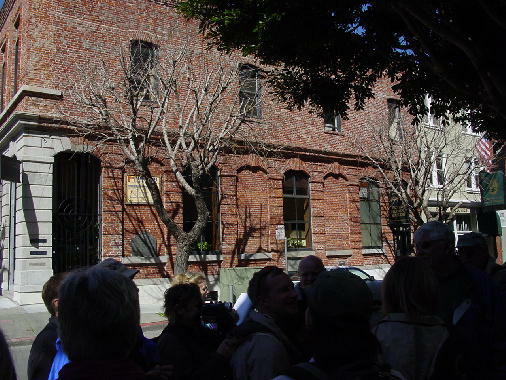 The first covered the South of Market area where then, as now, buildings had been constructed on old Mission Bay marshland that had been filled with sand and debris and where the damage and loss of life was staggering. The second walk focused on the fire as it spread from the South of Market area up toward Market Street and beyond. Finally, the third walk followed Montgomery Street through the north of Market area, following the path of the fire as it progressed into the old Yerba Buena Cove, a rough semicircle beginning at about Jackson and Montgomery to the north, continuing down to First and Market and ending roughly at Stewart and Folsom. 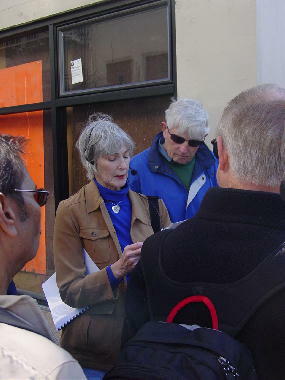 The following notes draw heavily on the excellent field trip guide prepared by Dr. Sullivan. 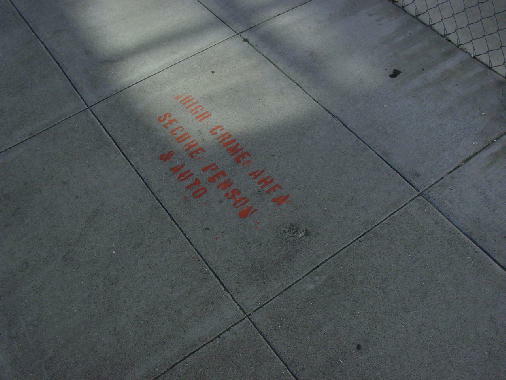 Walk one: South of market and the subsidence area. 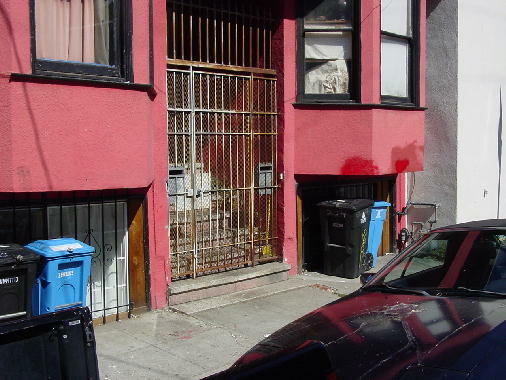 The first walk consisted of three stops within an area roughly bounded by Fifth Street on the north, Seventh Street on the south, Harrison on the east and Natoma on the west. The area rests on old Mission Bay marshland filled largely with sand from nearly dunes. The water table is very high and the potential for liquefaction is very great. 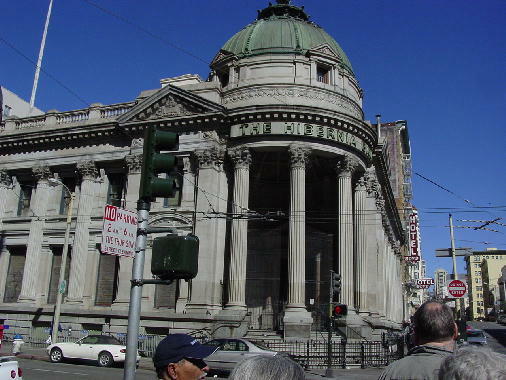 Not surprisingly, this area has been described as “Ground Zero” for the 1906 earthquake and the loss of life and property was among the highest in the city. Stop one: Sixth and Howard Streets. 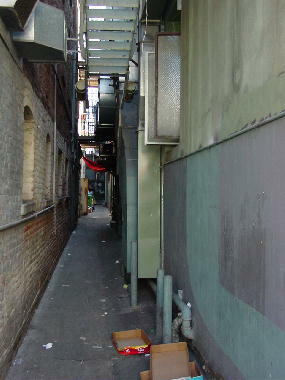 In 1906 this area was densely populated with immigrants and transients living and working in multi-story wooden frame buildings. When the earthquake struck at 5:12 AM most residents awoke to find their residences collapsing, the city water and sewage lines disrupted and the gas mains broken, as well. Between the extensive damage and the fire that almost immediately broke out, the death toll mounted rapidly to an estimated 300 people. Stop two: Intersection of Sixth and Folsom Streets. 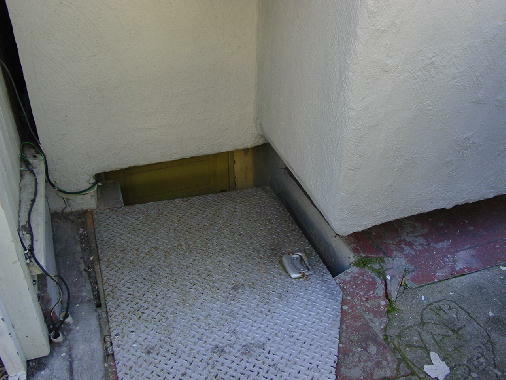 Walking along the side streets at this stop and the previous one, the role of subsidence in the area was apparent. 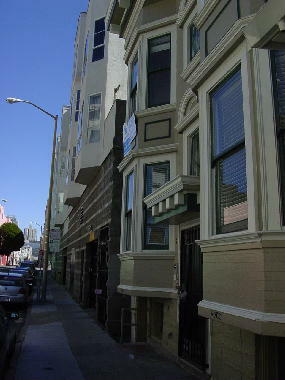 Although no 1906 buildings remain, and many buildings show the results of renovation following the 1989 Loma Prieta earthquake, there are still buildings clearly out of alignment, such as a residence at 481 Tehama Street, tipping gently backward from the sidewalk. Dr. Sullivan mentioned that although the fire in this area resulted from the ground shaking, another—and critical—fire had altogether human causes. Not far away, at Hayes and Gough, a family had been cooking breakfast on a damaged stove which quickly started a small fire. Normally this would have been quickly put out but, lacking sufficient water, the “ham and eggs fire” quickly became a full-fledged conflagration, gaining strength from prevailing winds and headed straight toward the destruction on Market Street and South of Market. The combined blaze was soon virtually out of control, leading to the decision to begin dynamiting any structures in its path so as to reduce potential fuel. This strategy proved to have ambiguous consequences as the dynamite and, later–when the dynamite was exhausted–black powder, often served to spread the very fire it was supposed to starve. Fire Chief Dennis Sullivan had been fatally injured by the earthquake and he would very likely have handled the fire in a far less destructive fashion than those fighting the fire without his direction. Stop three: Subsidence area. 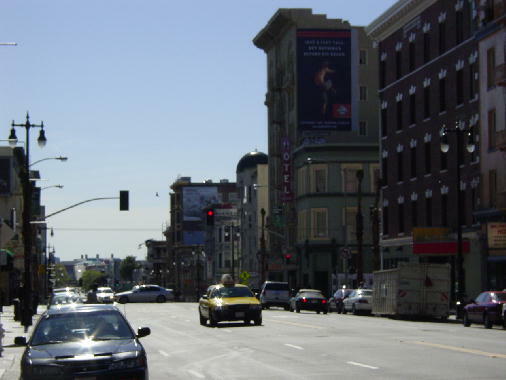 This area is bounded by Fifth Street on the east and Eighth Street on the west, Mission Street to the north and Bluxome Street to the south. 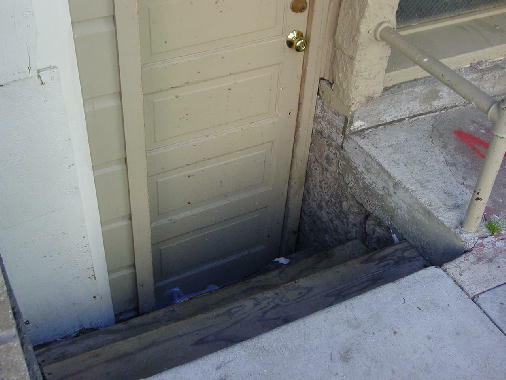 During this portion we observed some remarkable evidences of subsidence in structures along such small side streets as Shipley, Clara, Layton, Moss, Russ and Natoma, the most dramatic example being 623 Natoma. 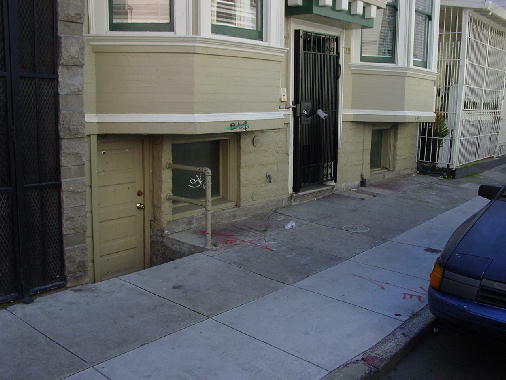 The first floor of this bay window home, typical of post-1906 construction in the area, has sunk completely below street level and its bay window is now only inches from the sidewalk. 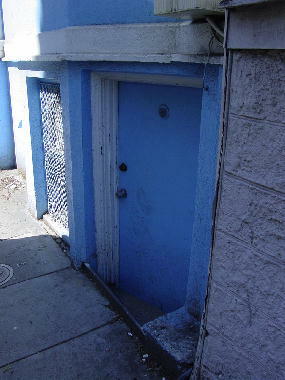 A former eight foot entry door is completely below sidewalk level and is just barely visible. Interestingly, real estate in this area, which had been relegated to the lower classes before 1906, now fetches an extremely high price. 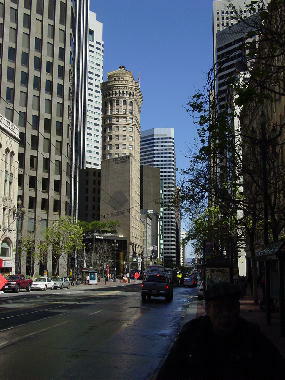 Walk two: Market Street from Seventh to First Streets. 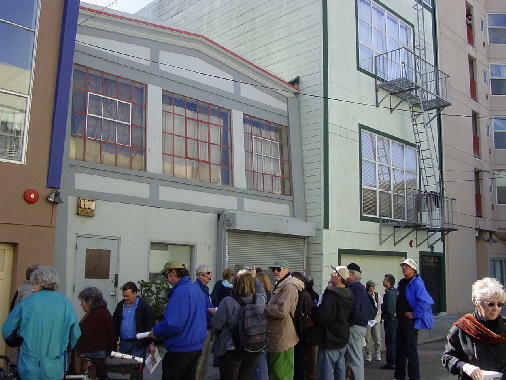 This part of the tour was notable for the number of pre-1906 buildings that either survived the earthquake and fire relatively intact or else where able to be restored, even to maintaining their original facades. As mentioned, steel frame construction was a key issue here. 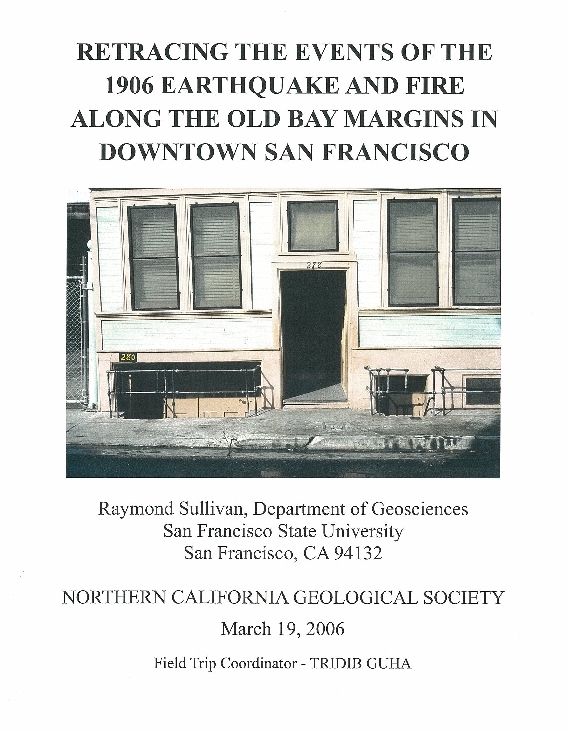 An 1868 earthquake along the Hayward fault—plus numerous pre-1906 fires—had alerted city planners to require that high-rise or official buildings be constructed of masonry or stone with steel framing. Although many wooden structures throughout the city did survive the earthquake with minimal damage, the fire that followed bore out the wisdom of the planners. 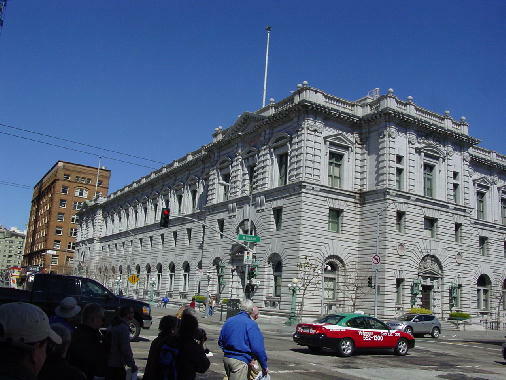 Some of the pre-1906 structures still standing along Market include the Sixth Circuit Court of Appeals (the old Post Office building), the Hibernia Bank building, the Flood Building and, especially, the Old Mint, just off Market at 88 Fifth Street. The current (April 2006) issue of Smithsonian magazine has an excellent article, “Grace under fire,” illustrating how the Mint was saved, along with $300 million in gold and silver (more than $6 billion in today’s dollars) which may have helped save the US economy from collapse. Stop four: Lotta’s Fountain (at Market, Montgomery and Post Streets). This gift to San Francisco from the famous gold rush actress and singer, Lotta Crabtree, survived the earthquake and fire and became the most critical gathering place for survivors seeking information about family and friends separated during the disaster. Survivors of the 1906 earthquake still gather here every April 18 and over a dozen are planning on attending this year’s memorial. 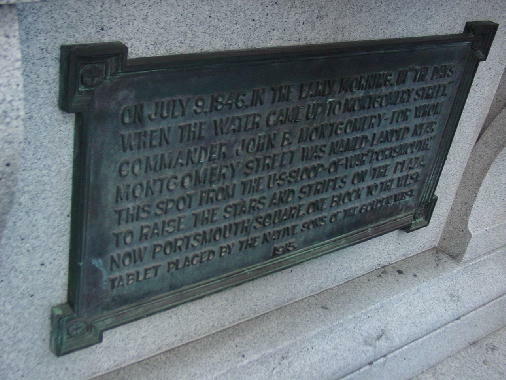 Stop five: Old Shoreline marker at the Mechanics Monument (Donahue Statue) (Bush and Battery). 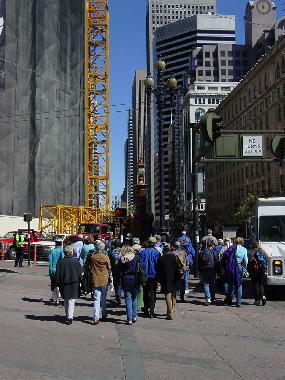 This six block area along Market Street, from Bush and Battery to the Ferry Building, showed, once again, the dangers of erecting high-rise structures on Bay fill. 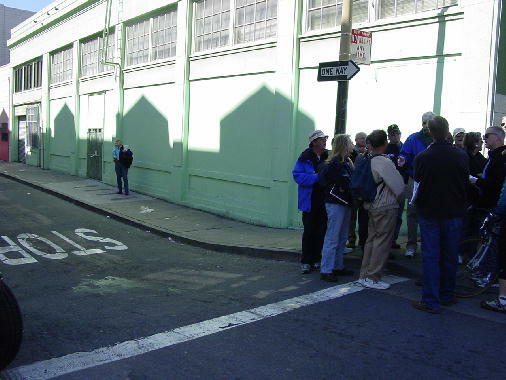 Collapsed buildings, along with ruptured water and gas mains, soon gave rise to several fires which, assisted by prevailing winds, quickly joined with fires begun earlier in the day, and headed toward the Ferry Building and the area north of market Street. Walk three: Montgomery Street to Jackson Square. After a delicious and filling lunch in Chinatown we proceeded to the final portion of the tour which covered what had been the Financial District in 1906. Since this area is underlain by Franciscan bedrock, this was one of the few areas that survived the earthquake relatively intact. Stop six: Portsmouth Square (Kearney between Clay and Washington). 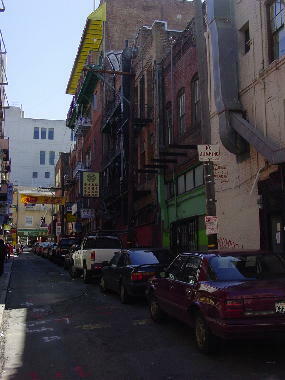 This was the location of the first settlement, Yerba Buena, which, by 1906, had become the heart of Chinatown. Ironically, most of the buildings in the area survived the earthquake with minimal damage and the residents originally felt they were safe. By early afternoon, however, the fire was unstoppable and, driven by winds, devastated the area. Stop seven: Jackson Square. 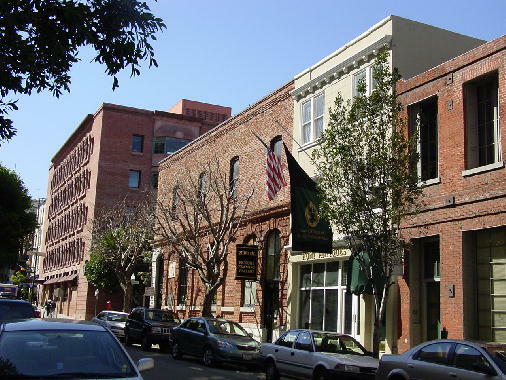 Bounded by Montgomery on the south, Jackson on the west, Sansome on the south and Washington on the east, this block showed amazing resilience and good fortune to survive the earthquake and fire largely intact. 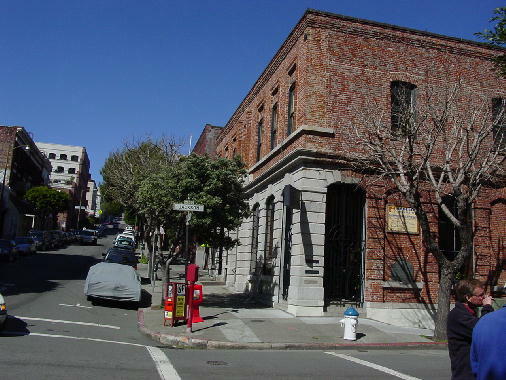 It contains some of the oldest commercial buildings in the city, especially along the 700 block of Montgomery and the 400 block of Jackson (including the Whiskey warehouse, of vital importance to save!). Although threatened several times during the three days of fire, on the final day a shift in the wind made all the difference and the block was spared. Altogether, the earthquake-created fire lasted three days and destroyed nearly 5 square miles of the city and over 28,000 homes. Over 250,000 people were homeless and the death toll was likely well over 3,000. In those three days the eleventh largest city in North America had been largely reduced to ruins and yet by Christmas eve, 1910 it had been so successfully rebuilt that a renowned opera singer could present a concert at Lotta’s Fountain to celebrate the rebirth of San Francisco. Those of us who had a chance to learn about the events of that era in a geological context found it an enormously valuable experience. 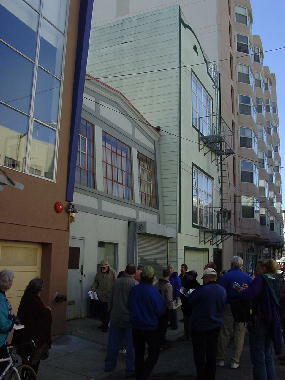 Several of us mentioned that we had walked by many of the buildings mentioned on the tour without much thought as to their remarkable history. As a result of this tour, few of us will do that again.